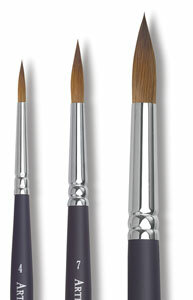 Winsor & Newton have created a brush perfectly matched to their Artists’ Watercolor paints. This series of professional quality watercolor brushes features specially selected Kolinsky sable fitted into seamless ferrules. The innovative contoured, double-bodied handle with a satin matte finish provides a comfortable, secure grip. Excellent color carrying capacity, ability to point, and spring back into shape are noted features of the “new classic” watercolor brush series.